Dean Anderson is the face of Smartshares for many advisers - but do you know where he spent 2006? I’m Dean Anderson, Smartshares Product Manager. I support the development of Smartshares Exchange Traded Funds (ETFs), which has expanded from five ETFs in 2014 to 23 today, with more than $1.9 billion in funds under management. My focus is on maintaining relationships with financial advisers and wholesale groups who invest in our ETFs, while adding to the industry-wide effort to educate potential investors about the value of investing and saving. After completing a Bachelor of Commerce, majoring in finance, at the University of Canterbury, I started work in the energy sector. I joined NZX five years ago, and since then have held several roles in the energy and data licensing teams. In 2014, I joined the funds management team, and took on the role of Smartshares Product Manager. This graph is from EY’s “The next generation of financial advisers” report. It highlights the challenges our industry is facing to recruit younger advisers, and six steps needed to help turn this around. 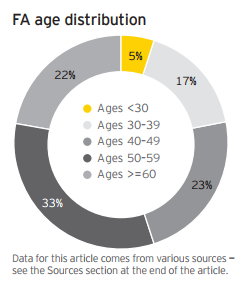 Unsurprisingly, the US based report shows that only 22% of advisers are aged under 40, and only 5% are younger than 30. While I haven’t seen any numbers for the New Zealand market, my travels would indicate that the figures aren’t too dissimilar here. It would be great to see more young recruits in our industry as it provides greater options for succession planning, bridges the cultural gap with different client segments, and encourages diversity of thought. Rather than one piece of advice, I’d like to share an attitude that has been instilled in me around work ethic – push for opportunities, and save for the future (this shouldn’t come at the expense of enjoying life either!). Like all industries, the financial advice sector is going through a period of regulatory changes, technology developments, and demographic shifts, and advisers need to manage and adapt to these. I have seen discussion groups work really well in other industries. This is where say three to 12 firms get together on a regular basis and share insights into their business in a confidential manner. This builds a strong network to capture opportunities as well as provide support when times are challenging. One of the main benefits from the recent FMCA regulation changes has been the increased transparency for investors who can now review standardised offer documents, compare investments and returns on a like-for-like basis, and see what the total costs of an investment are. What could be done to help get more New Zealanders investing? Education, technology, and communication are three big levers that will help build financial literacy in New Zealand so that people feel more comfortable investing – as an industry we have a role to play in developing this. One of the best things about my job is that I get to speak to a range of groups – such as the New Zealand Shareholders’ Association, or attend client evenings held by financial advisers – on the benefits of passive investing. I’ve learnt a lot from these sessions, and it has reinforced to me that there is no shortage of people wanting to learn more about investing, it’s just they simply didn’t know where to start. Do you think there is further room for growth in passive investments? Smartshares expect to see continued growth in the uptake of passive investment solutions as advisers and investors become aware of the challenges of finding active managers who can consistently outperform the market over a period of time. Reports like the S&P DJI Persistence Of Australian Active Funds highlighted this with only 3.5% of out performing funds able to continue their outperformance over a five year period from 2012. Travel is the top to-do. I recently returned from two weeks in Vietnam – a fantastic country, highly recommend. I have been amazed at the number of people who have also been there this year! I spent 2006 in Brazil – a big cultural shift going from living in Nelson to the heart of Sao Paulo. Something in the financial sector that involves working and meeting a range of people. Oh dear, more fake news, and the author is none other than the Product Manager for Smartshares who really has less motive to distort the facts than most. He says “one of the main benefits from the recent FMCA regulation ….. has been increased transparency for investors who can now ….. see what the total costs of an investment are”. Fail. Doesn’t he know that the FMCA doesn’t require transaction costs to be disclosed? One fund I saw had transaction costs in the 12 months ended March 2016 equivalent to 1% of NAV. Is this material? Of course it is. Is it disclosing all the costs? Of course it isn’t. Doesn’t he know that the FCA is requiring transaction costs to be included in a single figure measure of costs? Maybe he doesn’t. What is really disappointing from Smartshares’ perspective is the fact that the turnover of passive funds is much less than the turnover of active funds, most often, so the poor legislation actually disadvantages passive funds. I would’ve thought he would be aware of these issues.